I never knew that strollers had evolved so much over the years. I have always used and loved our existing stroller brand with both Harper and Noa, but since partnering with Babies’R’Us Canada, I was given an opportunity to venture out and see what else was out on the market. 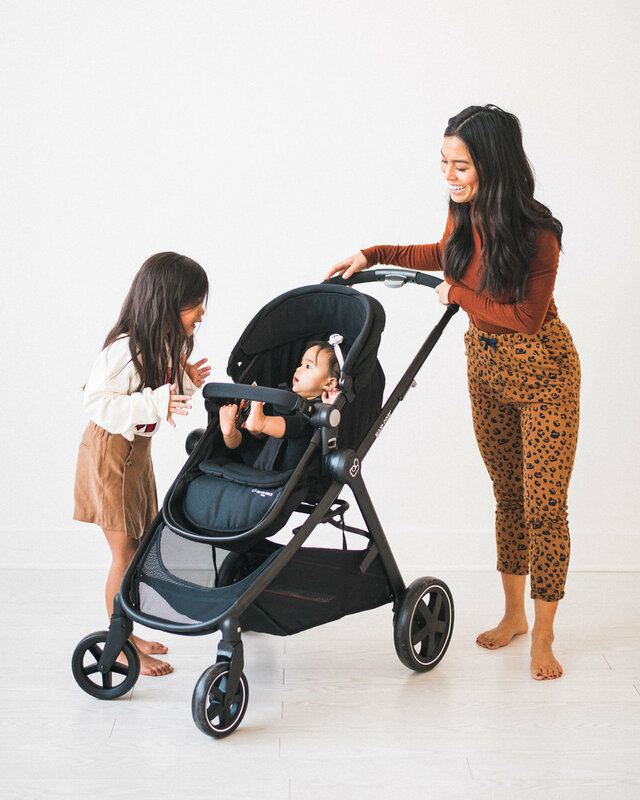 Plus, it’s important for me (and all of us mamas) to stay up to date with what’s new and exciting in the stroller world because so much is changing all the time. From size and weight to prints and patterns, the stroller game is no joke! As we all know, making anything more convenient and easy is essential for #momlife. As I learned about different strollers, this was made a huge priority by many brands. I was actually curious about how each stroller would make this happen! Babies”R”Us Canada asked me to take the latest Maxi-Cosi Zelia 5-in-1 Modular Travel System for a stroll and share my thoughts. I’ll start by saying I had my doubts, but that fortunately changed when I took the Zelia out for a stroll and was pleasantly surprised by how compact and lightweight it was. What’s more,the Zelia smoothly transformed from stroller to carriage-mode in seconds (convenient, right? ), and the reversible seat allowed baby Noa to face outwards or towards me. I’m all for changing up her view when we go for walks! As mentioned, I think convenience is so important for moms. The Zelia comes with the Maxi-Cosi Mico 30 infant car seat, which easily attaches with the provided adaptors. That means you don’t have to go and shop for one separately. This eliminates that part of the process (which is not that fun) and could be a big attraction for moms. Saving on time is one thing, but saving on cost is an extra bonus! I have to say that the Zelia Travel System is well priced in comparison to some other stroller systems. It is listed as $699 on the Babies”R”Us Canada website. When it comes to infant car seats, we all want the best. The safest. The lightest. I recently learned that the Maxi-Cosi is listed as the #1 selling infant car seat brand worldwide! I think this fact resonated with me and it was a bonus that it comes with the Zelia Stroller. The Mico 30 car seat can hold an infant from 5 to 30 pounds and better yet, it’s the lightest infant car seat* in its class. I actually went and lifted various car seats myself to compare - some felt like a major workout. I think I’d much rather leave the lifting at the gym! I wasn’t going to talk about cleaning, but this part is actually really important to me. I can’t stand a dirty car seat, so I love that the seat fabrics are machine washable and dryer safe. The innovative seat pad design also allows for removal within seconds. Trust me, I’ve had my fair share of challenging times trying to clean car seats. No thank you. *When compared to similarly priced infant car seats with the same weight range as of August 2017. Overall, I am pleased with this travel system and appreciate having another option to use with Noa. I love how it is lightweight and has an affordable price point. I’m considering testing it on an upcoming vacation to see how it compares to our other stroller when it comes to travel. I’m confident that the Maxi-Cosi Zelia 5-in-1 Modular Travel System will make movement with baby a breeze wherever we go!